A competitive economy allows consumers to demand bigger, faster, stronger everyday services and companies are more than happy to accommodate. It has brought in countless advances in technology over the years. For example, 1G technology brought us the mobile device. The 2G network brought us the ability to text and receive/send data across devices. Then 3G brought us to the web and 4G made it faster. 4G LTE is great but we can do better and it turns out we will. Now with more people connected than ever, carriers are making strides towards a 5G network that will redefine high-speed wireless communications. 5G has been rumored to be 10-20 times the speed of 4G. The 5G network operates at a much higher-frequency than 4G. This means HD quality videos can be downloaded in a snap and buffering will be a thing of the past. In addition, 5G has been speculated as a replacement for home Wi-Fi networks. To sum it up, 5G means much higher speeds and capacity with lower latency. Eliminating that annoying Netflix buffer will be great but 5G’s ability to connect to more IoT (internet of things) devices will really set it apart. Data and commands will travel much faster without interruption making technology such as self-driving cars a real possibility. Reliable connection and ultra low-latency is good news for any business. 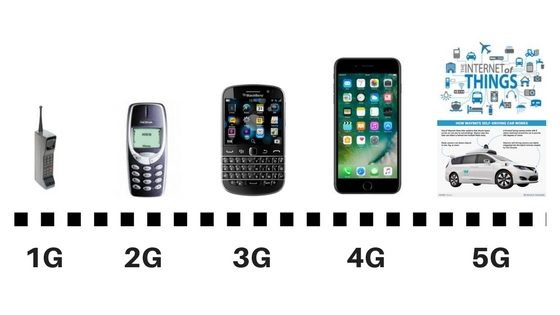 While 4G is technically available for businesses today it does not offer the consistency of 5G. When analyzing broadband options for your business 5G will be a conceivable solution in the future. It has the potential to eclipse wireline broadband solutions for businesses. Also, 5G will become a cheaper service than traditional Ethernet for businesses with multiple branches. Carriers will look to benefit as well. They are hoping to replace costs of management, maintenance and upgrades associated with physical connections. Any IT person who has had to wait on these types of services can appreciate the win-win with this. Quick answer is yes and no. The infrastructure is not there yet. There will be initial rollouts built in major metropolitan areas but even that will be limited. 5G requires an overhaul in the amount of cell towers and antennas needed to support it. Since 5G operates at a higher-frequency it means that these millimeter waves cannot travel as far as lower-frequency waves. Things such as buildings, walls and other obstacles make it difficult to connect. This is not ideal for things such as self-driving vehicles and other IoT devices. In area’s that could support 5G today there are still no commercially available hardware/devices that work with 5g on the market. Cell phones do not have the antennas and chips needed to talk to 5G towers. Businesses will have to replace their current corporate devices sometime in the future to utilize 5G. However, the cost to upgrade needs to be compared to the benefits from faster speeds and productivity of the mobile worker. While the full benefits of 5G for businesses may not be realized till mid-2020, it has the potential to change the landscape of enterprise communications. Teligistics has witnessed many dynamic shifts in communications during our 21-year history. We have advised hundreds large enterprises on the technologies of tomorrow. To learn more on this or other services like it, contact Teligistics today to consult on your current telecom environment.